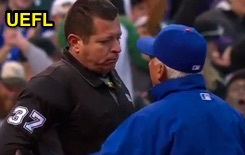 HP Umpire Carlos Torres ejected New York Mets Manager Terry Collins for arguing a foul ball call in the bottom of the 3rd inning of the Mets-Rockies game. With one out and the bases loaded, Rockies batter Tony Wolters attempted to strike a 2-2 curveball from Mets pitcher Logan Verrett, ruled a foul ball. Replays indicate Wolters' bat did not appear to make contact with the pitched baseball, the call was incorrect. At the time of the ejection, the Rockies were leading, 3-1. The Rockies ultimately won the contest, 7-4. This is Carlos Torres (37)'s first ejection of the 2016 MLB regular season. Carlos Torres now has 0 points in the UEFL Standings (2 Previous + 3 AAA - 1 Pen - 4 QOCN = 0). Crew Chief Gerry Davis now has -1 points in Crew Division (-1 Previous + 0 Incorrect Call = -1). This is the 18th Manager ejection of the 2016 season. This is the Mets' 1st ejection of 2016, T-2nd in the NL East (MIA 3, ATL, NYM, WAS 1; PHI 0). This is Terry Collins' first ejection since September 30, 2015 (Bob Davidson; QOC = U [Throwing At]). This is Carlos Torres' first career MLB ejection.